Lately I have been noticing a very disturbing trend. Without regard, you waltz into the coffee shop as if you own the place, claim your space, spread out your stuff, plug into the power outlets, login to the wifi, and work… for hours, and hours, and hours. Maybe it’s because your so caught up in your work that you don’t notice… as the cafe fills up, people begin walking in to enjoy the work of their favorite barista, but there is nowhere to sit, so they turn away to their next favorite spot around the corner. 2 hours, 3 hours, 4 hours go by and you have only had a single $1 shot of espresso, and in many cases maybe nothing at all since your too busy working on your new spiffy travel blog or startup to realize you haven’t made it to the counter to order yet. Though my job allows it, I’ve not been a big coffee shop dweller, save a few times during major powercuts that have knocked out the internet in my flat and local co-working spaces. The chaos distracts me and there aren’t any real boutiques places where I’m based – it’s also a rush to get to one to start work at 8:00 am…but that’s another story. Ian points out that owners of independent, small coffee shops are entrepreneurs too. Running on the WiFi all day off the back of a single coffee might be ok in Starbucks – down that corporate beast – but it isn’t good business for small coffee shop owners; many of whom are too polite to send a tight-assed foreigner packing, or suggest they spend some money. The truth is that if that’s your approach, you’re missing out on a great chance to engage with someone of a different culture, talk business, tech or a whole host of other things – particularly if you’re in town visiting. Then there’s the very affordable food and drinks, they don’t cost much but go a long way for owners. 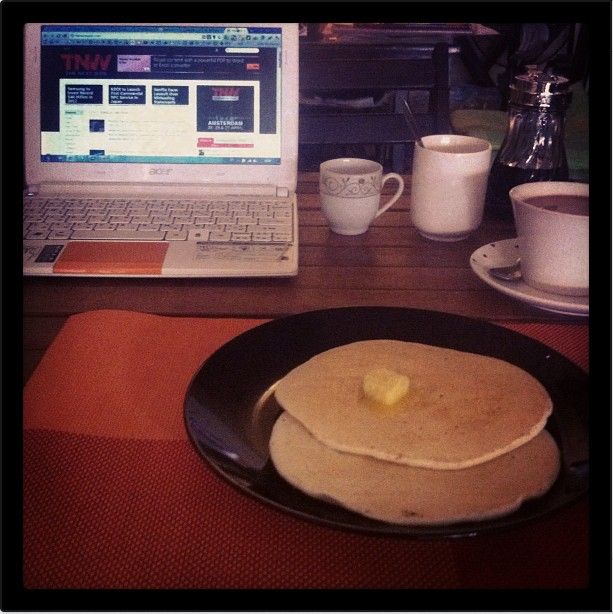 My favorite ever work session was at a delightful coffee-pancake house in Vientiane, Laos. Bonus, check out the dodgy Acer netbook I was rocking on my travels. I had spent the morning going from one cafe to another before the charming owners, their killer coffees and delicious pancakes reeled me in for the afternoon. Sure, I got my head down to work when I had to, but it was great to chat to them…and the food and drinks were out of this world. If you’re lucky enough to have that opportunity, don’t abuse it.